A Scottish university is preparing to right a 150-year-old wrong, by letting its first female medical students graduate. The "Edinburgh Seven" were the first women to study medicine at any UK university. But they were banned from graduating after academics voted against it. A full-scale riot broke out when the women turned up to sit an anatomy exam at the university and male students pelted them with mud. The seven pioneers - Sophia Jex-Blake, Isabel Thorne, Edith Pechey, Matilda Chaplin, Helen Evans, Mary Anderson Marshall and Emily Bovell are to be awarded honorary degrees on the 150th anniversary of their matriculation at the University of Edinburgh. They will all be awarded a posthumous MBChB on Saturday 6 July. Professor Peter Mathieson, principal and vice-chancellor of the university, said: "It was a great source of credit to the university that they were admitted here, the first women to do any degree at any British university. "Then it was a source of embarrassment that they were never allowed to graduate and so it was a way to correct a historical wrong." The Royal College of Surgeons of Edinburgh unveiled a plaque commemorating the medics' achievements last March. Who were the "Edinburgh Seven"? Sophia Jex-Blake led the women's education charge in Britain, but faced opposition to her aspirations from an early age. She wanted to be a doctor in a time when it was unthinkable for a woman to be one. After a period of study in Edinburgh, Jex-Blake travelled to the US in 1865 to learn more about women's education. Following her dream of becoming a doctor, she was refused entry to Harvard on gender grounds, a rejection letter reading: "There is no provision for the education of women in any department of this university." 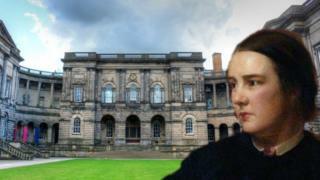 Jex-Blake looked to Scotland, where a more enlightened view on education was emerging. In March 1869 after much internal strain, Edinburgh University approved Jex-Blake's application, but it was eventually rejected by the university court on the grounds the university could not make the necessary arrangements "in the interest of one lady". A campaign carried in The Scotsman newspaper called on more women to join her. The story gathered attention and six more women joined her cause, pushing to study medicine in Edinburgh. In November 1869, the women passed the matriculation exam and were admitted to the university medical school. The university charged them higher fees and the women, led by Jex-Blake were forced to arrange lectures for themselves due to a loophole whereby university staff were permitted but not required to teach women. This was just the start of the problems they would face. In 1873 the Court of Session ruled in favour of the University's right to refuse the women degrees and also concluded the women should not even have been allowed to study at all. The medical faculty's Professor Robert Christison - a former head of the British Medical Association - thought women should become midwives rather than doctors. But Dr Chloë Kennedy, who teaches Criminal Law at Edinburgh University, has written an alternative ruling where the women win their case for the Scottish Feminist Judgments Project which uses laws of the time to imagine how things might have different if the judge had adopted a feminist perspective. She said: "There were arguments that the university had been set up, designed for and exclusively served men at that point. "And the university may not have had the power to grant the degrees." These days at Edinburgh University around 60% of undergraduates are women. The university is also launching an appeal for family members of the seven women to come forward ahead of the ceremony. Few photos exist of the women in the university's archives and it is hoped family or others could also help with this. Any family members of the Edinburgh Seven, or those with photographs, are asked to contact press.office@ed.ac.uk.